Students in the MSTP integrate both graduate and medical studies into their curriculum. In addition, because the students carry out their graduate research in so many different fields and programs, no single schedule is appropriate for all students. Therefore, our policy is to allow for maximum flexibility with continued guidance and monitoring. 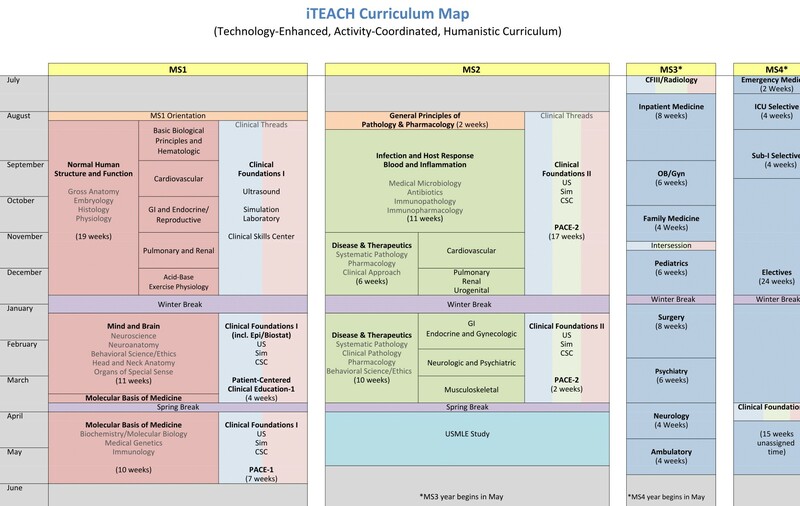 The graduate school courses for an MSTP student are determined by the thesis committee in conjunction with the graduate department, with the dual goals of adequately preparing the student for research in the chosen field while eliminating course overlap with the medical school curriculum. The average time to completion of both degrees is approximately 8 years. Students in their graduate years are encouraged to continue exposure to clinical medicine through participation in the Clinical Experience Program and the Translational Medicine Journal Club. Students are also encouraged to explore opportunities in other fields, such as Social Ecology, Public Health, Humanities, Anthropology, etc. Students are required to complete two rotations between their first and second year of medical school. Depending on their experience in these, they may complete one-two more rotations after their second year of medical school before deciding on a graduate program and PI Mentor. Rotations are allowed through the first quarter of year three.